Last post for beer week at EDS! 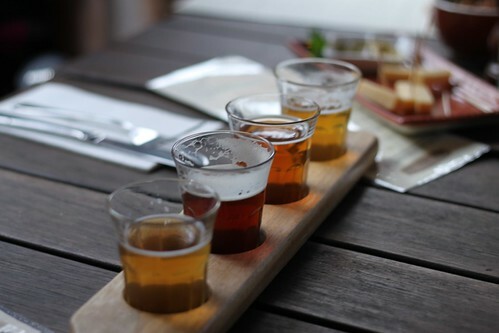 Last weekend was the ‘Secret Stash’ weekend at the Red Hill Brewery down in the Mornington Peninsula area and thus an excellent excuse to get together some good foodie/beerie mates for a stellar pub lunch. 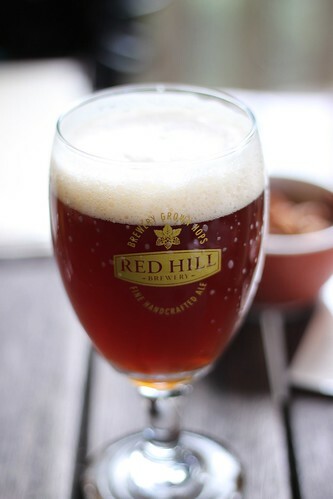 I have much fondness for the Red Hill Brewery because it was one of the places that helped me realise just how wonderful the Australian craft beer scene is. When I first went there, it was Secret Stash weekend which is generally when special brews go on tap and are made available to the public – this particular weekend, they had their scotch ale (remains a favourite of mine to this day) which had been aged in a barrel – just a tad more special than the scotch ale proper. I bought a stein and elected to get it filled up with the special scotch ale. Not a drop wasted! 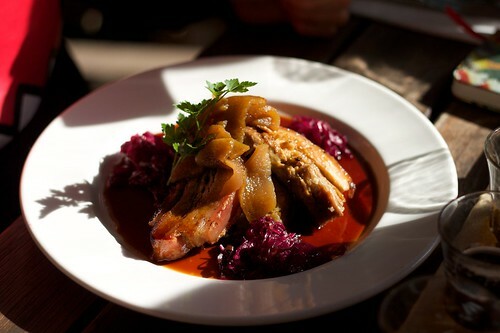 For lunch that day, I had the bratwurst with parsnip mash and braised red cabbage and Tris had the pork hock with beetroot spätzli. Not fantastic photos, sorry, was in a bit of a rush to eat! The brewers were knee deep in our hops for this special brew, using hops just harvested from our own vines which were then steeped in our conditioning vats for months, this is a traditional English style bitter. Copper in colour with a strong malt character, balanced by the use of our new seasons Willamette and Goldings hops to create a full hop flavour and aroma. The complex grain bill provides a full, rich & malty ale that has hints of marmalade and lashings of hop resin flavours, finishing with a peppery spicy note. Good chums Colin, Suz and Lindsey had got there before us and were chowing down on starters – Colin’s nuts (I’m afraid that joke isn’t ever getting old even though it’s been done to death) and some gouda cheese. Colin had ordered the Welsh rarebit but it was scoffed into oblivion before I arrived. Drink-wise both Suz and Colin got beer tasting paddles – the one offering the Bohemian Pilsner, Belgian Blonde, Hop Harvest Ale and Temptation. I got to test the ‘hair of the dog’ theory after a rough night beforehand and ordered a pot of the Bohemian Pilsner. It’s extremely crisp and refreshing, has a thin body and would be a fantastic summer session beer. It becomes less hoppy as you continue to drink it. Gah, why wasn’t I drinking more of this when it was summer?! Time for lunch! Suz and I both ordered the chicken pot pie. Just perfect for the nippy weather. Very hearty! I think this might also have been flavoured with one of the Red Hill beers but because I neglected to take a photo of the menu, I can’t tell you which one but I suspect it might have been the wheat beer. 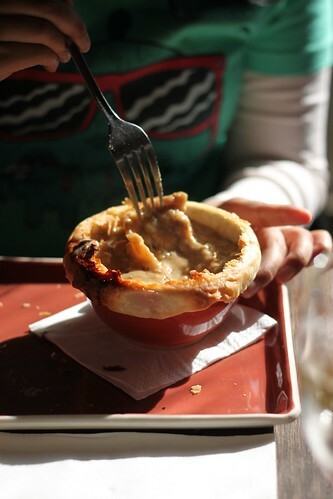 Update: the kind RHB folks tell me the pie is flavoured with their scotch ale and has wild mushrooms in it. Cheers guys! 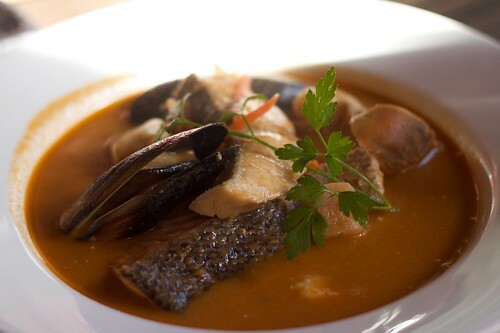 Lindsey and Tris both ordered the waterzooi – a seafood chowder. Fuku-san! update: I’m told it had a generous amount of seafood including mussels, prawns, Moreton Bay bugs, some sort of fish and possibly scallops. Shame there was only one piece of bread to mop up the rest of the moreish soup. You see Linds, I do know what Iron Chef is. Thankfully, there was no choice regarding dessert. 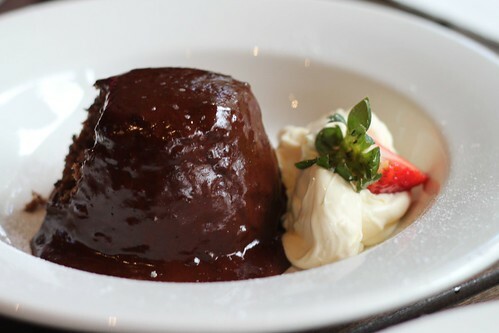 It was steamed chocolate pudding, or nothing. All five of us had dessert. A most generous serving it was too! Suz, Lindsey and I had a goblet of the Imperial Stout though I think I was the only one to get it with dessert. It is rich, with a thick creamy head. I find it has hints of burnt coffee and it’s very velvety. No wonder I didn’t finish dessert. Much maltier and sweeter than I expected, it’s also quite a filling beer. Medium bodied and suited the bracing Victorian weather which on this particular day could not make up its bloody mind. I do wish I took Mum here for Mothers’ Day lunch after all. While it is a brewery, they serve excellent food, locally sourced when possible. People don’t just come here for the excellent beer and that was evident upon last visiting. The tables were packed with very hungry folks. On a personal note, it was lovely to meet Karen, the part-owner of Red Hill Brewery and the lady responsible for the brewery’s Twitter presence. The very first Ale Stars I ever attended, we had the pleasure of the other co-owner and brewer David coming up and giving us the ideal show-and-tell. I won’t lie – I was flattered that Karen wanted to meet me. It’s not often people want to do so just because of what I write (usually when I tell people I write poetry, they back away like I’m an escaped psych ward patient. Sad thing is, I don’t blame them!). Enough babbling from me, if you’d like more information on the brewery, head over to their website and plot a visit. News-flash! Red Hill Brewery picked up some awards – will update with more comprehensive information and please forgive me for the time being for referencing a tweet! No official information as yet but you can read some of the results over at The Crafty Pint. This entry was posted in craft beer goodness, eatie-foodies dining out and tagged Australian International Beer Awards, beer tasting, Hop Harvest ale, local produce, Mornington Peninsula, Red Hill, Red Hill Brewery, Secret Stash weekend, Victorian microbrews on May 20, 2010 by gem.